Recently, Jeff and Sara Mouttet, owners of Riverside Cigar Shop and Lounge in Jeffersonville, Indiana, across the Ohio River from Louisville, sent us a couple of samples of their new House Blend. I always find the story of a new cigar intriguing, so I posed some questions about this venture to Jeff via email. And, indeed, it turns out to be an interesting story. Stogie Guys: Your website shows a very extensive selection of top boutique cigars. What made you decide you needed to add your own line? Jeff Mouttet: There were several factors that led us to the decision, but first and foremost, we always wanted our own blend and always planned on doing one as soon as the time was right. Additionally, we’ve made good friends with many outstanding boutique cigar makers (Skip Martin and Mike Rosales, Sean Williams, Gary Griffith, Chris Kelly, Enrique Sanchez, Noel Rojas, Sam Leccia, etc.) and we wanted to work with them to do something for us. Lastly, it’s a good business move. We’ve been fortunate to build a loyal clientele over the last three years, and it’s surprising how many people ask if we have our own cigars. Well, now we do. SG: Walk us briefly through the process of going from idea to cigars on the shelf. JM: It’s kind of funny, because I had Manny Iriarte design the band over two years ago, but the cigar just now happened. Noel Rojas came through the store on a trip through the area and House of Emilio asked if we minded if he stopped by for a night and did a quick rolling demonstration and, being up for most anything, we said yes. So during the course of the night, after everybody raved about how good Noel’s cigars were, Noel and I sat down and talked numbers, blends, volumes, etc., and we decided right then and there to go ahead and do it. As far as the process, I leaned pretty heavily on Noel’s expertise. I’m a cigar smoker—have been for 30 years—but I’m no blender. Not even close. Maybe one day, but at this point, we left most of that to Noel, and I’ve got to say, I’m glad we did, because he did a fantastic job. SG: Did you have a specific profile in mind from the start, or did you explore a variety of blends until you found one you liked? JM: We did have a specific strength profile in mind, not so much a flavor profile. 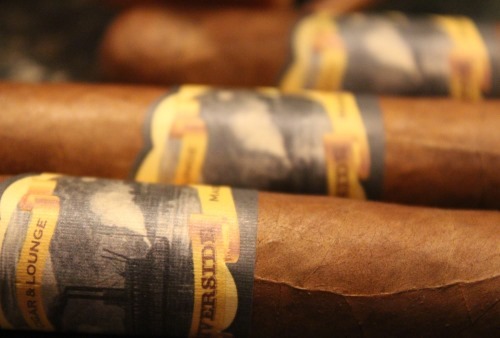 We tried several blends, and ended up with the Ecuador Habano with Nica filler and binder. SG: What has been the most difficult part? The biggest surprise? JM: Waiting, shipping, customs, and “Central American Time” have been the most difficult parts of the equation. Well, those, and getting the bands to Nicaragua. The biggest surprise has been the reception of the cigar. We’ve sold nearly 1,500 cigars (all we had made for the first run) in a little less than a month, and that’s just on-premise sales. SG: Do you have a plan to produce more cigars, maybe distribute them, or will this be it? JM: Our goal over the next 2 years is to introduce at least two more cigars to the market. We’ve talked to both RoMa Craft and Tesa Cigars about an ongoing manufacturing relationship and both are receptive to the idea. Ideally, we’d like to have “house blends,” or Riverside exclusive blends, make up around 30-40% of our boutique line sales. Distribution is a little trickier if we keep the Riverside name on the cigars, but that may be something we address in the future. I know I would have trouble justifying somebody else’s store name in my humidor, so let’s just say we’re sensitive to that issue. At the same time, I think the quality of the cigars we’re making merits distribution, so we’ll explore that when it looks more feasible. SG: Are you doing any mail-order or telephone sales for those outside your area who want to try the Riverside House Blend? JM: Yes. You can call 812-284-6198 or email me at jeff@riversidecigars.com and we’ll be glad to ship. Given all the recent credit card issues we can only take Visa over the phone, but we do have a PayPal account for the store, too, so we have a couple of ways you can pay. Talk about great timing! My friend and I have just returned from what has become an annual pilgrimage weekend in Louisville/Jeffersonville (to catch horse racing and an afternoon at Riverside Cigars). 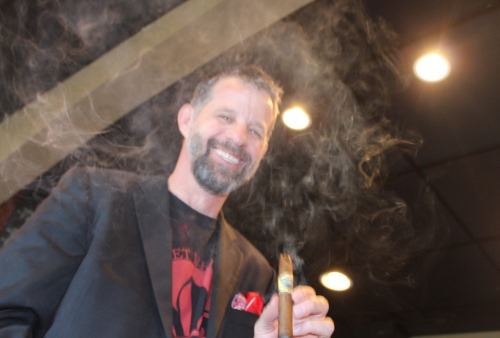 Jeff's cigar selection is outstanding, his staff recommendations can be trusted without question, the food and drink are first-rate–and the clientele are as friendly as they come. Can't wait 'til next year! From the looks of his website, Manny Iriarte has designed many of the cigar bands that I'm familiar with (and are always in my humi). I don't know much about this side of the business. George, perhaps you could do a Cigar Insider with Manny? I'll put it on the list! I'm sure he would be very interesting. Yesterday I use cigar with my friend walking along the road. It was really a nice flavor.